Trying on bio (b.e) eyes sunglasses. Photos by VW. I am greeted by a courteous staff and admonished to choose a pair of sunglasses. I settle on wayfarers with black frames and black-burgundy temples (including a collapsible case). Done and done. Now, I am challenged with relieving a tray of an inviting glass of rose, swiftly followed by another offering tuna tartare. Indeed, it is summertime and the living is easy. It is also Day 3 of New York Fashion Week: Men' s S/S 2017. Moreover, it is launch day for bio (b.e) eyes. It's unfolding on the patio of Hotel Americano. A hotish evening on which a passing shower is forecast. No one on the patio is concerned. 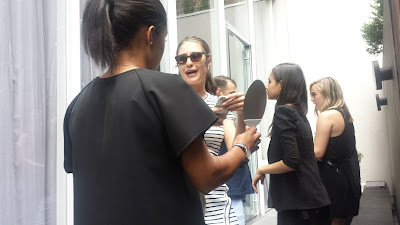 Media and tastemakers are mixing, mingling and fondling frames. Eating, drinking and generally making merry in the cause of good. The good and the cause: "Buy a frame, Help a child to see." Purchase a pair of bio (b.e) eyes, sold exclusively at Walmart, and part of the proceeds from the sale goes to secure spectacles for a child in need. And all of the fixins, too, including vision screening, eye exams and surgery. 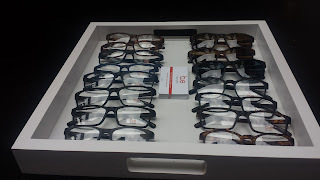 Each pair of bio (b.e) eyes frames sold will help a child with vision problems. Walmart and the Seva Foundation are partners in this program. This is what the latter does to make the world a better place. All in the cause of preventing blindness. Incidentally, spectacles play a huge role in sight retention. A light rain has begun to fall. No one is fazed, though. Not the hosts of the bio (b.e) eyes launch, bloggers Natalie Suarez (Natalie Off Duty) and Moti Ankari (The Metro Man). They are laughing and talking, seeming to genuinely enjoy themselves. Seeming to give the rainfall the cut direct: "We will not allow the likes of you to rain on our parade." Still, the head PR maven secures several patio umbrellas. Inexplicably, the patio awning is broken. "I found out the hard way this morning," reports the unflappable PR maven. Walmart. Not everybody's favorite, what with allegations of low wages and union-busting, among others. Still, the big box juggernaut deserves at least a grudging nod for this good deed. Certainly, Walmart has the bandwith to handle countless orders of sustainably produced bio (b.e) eyes. The goal is to get a pair on the bridge of the noses of 200,000 Indian children this year. As of this writing, nearly 80,000 frames have been donated, according to the counter on the bio (b.e.) eyes website (http://www.bio-eyes.com/counter/). Attendees at the launch of the bio (b.e) eyes eyewear collection chose from one of four styles of sunglasses. 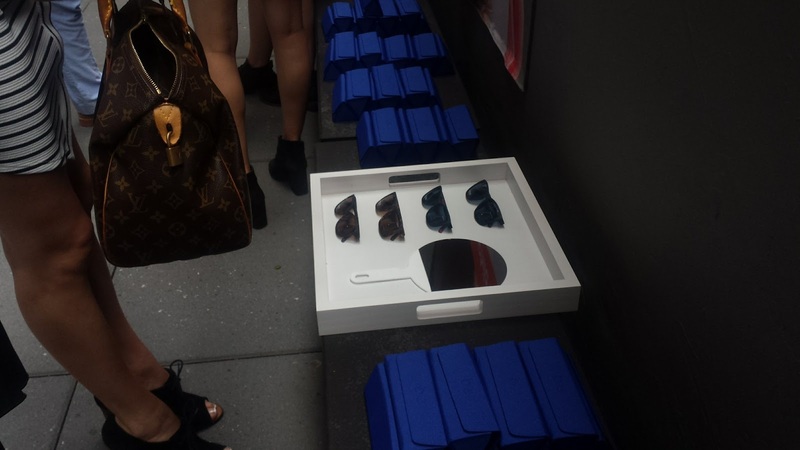 The shades came with a collapsible case in royal blue. As forecast, the rain was a passing fancy. It has stopped. More revelers have arrived. There is excitement in the air. Rose continues to make the rounds; beer, too. The tuna is a hit. Ditto for the cucumber thingey. Everybody has a new pair of sunglasses [bio (b.e) eyesstyles] to add to his/her collection and ocassion to wear them right now: sun is slowly breaking through clouds. It's summertime, and thanks to bio (b.e) eyes, the living is going to be easier for a lot of children. Visit http://www.bio-eyes.com/ to learn more about bio(b.e.) eyes and http://www.seva.org/ to learn more about the Seva Foundation. 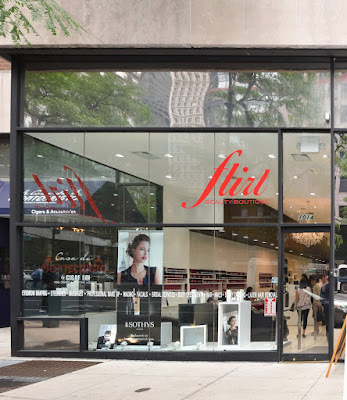 Flirt Beauty Boutique has started a benefit series for New York City nonprofits. Photos from Annie Watt Agency. APPARENTLY, Flirt Beauty Boutique got the memo that declared that charity begins at home. Natalie Glaser and Nicole Dicocco at Flirt for a Foundation event in support of Trevor NextGen. 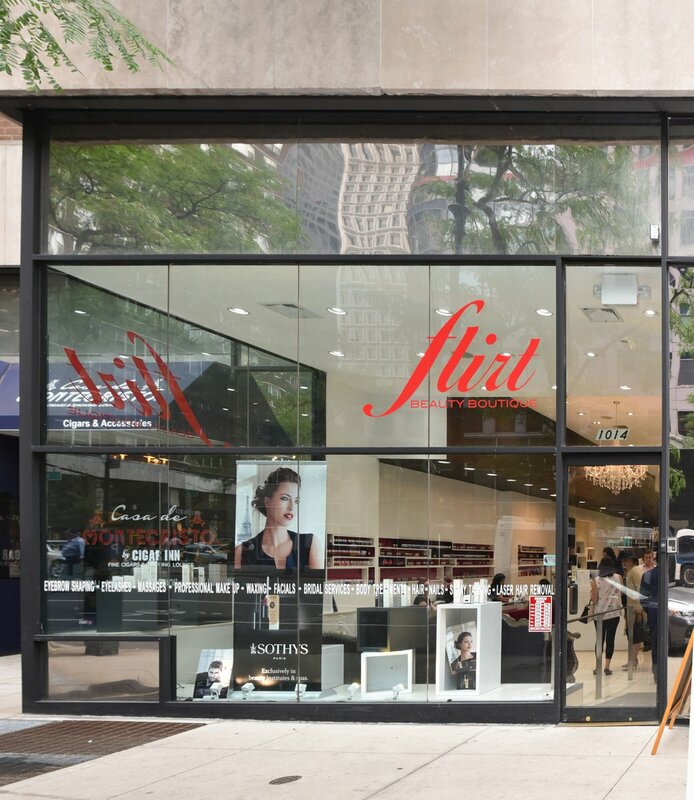 The Midtown East full service spa has opened its heart and pocketbook with the event series, Flirt for a Foundation. Through the foundation it supports New York City-based nonprofits. Last week, Trevor NextGen (a program of The Trevor Project) benefitted from Flirt's generosity. Attendees at the Flirt affair submitted to manicures, blowouts, brow-shaping and other such services. Twenty percent of proceeds went to Trevor NextGen. Flirt's haistylist Mila Sopiyeva plying her trade. The mission of The Trevor Project is to provide crisis intervention and to end suicide among LGBTQ young people 13-24. 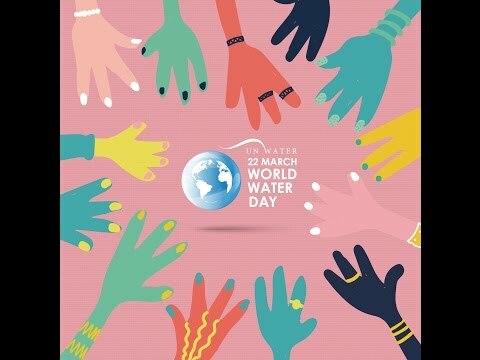 Through Trevor NextGen, young volunteers are trained to create awareness about and further the work of the organization. A value-added benefit of a hot stone massage. Visit http://www.flirtbb.com/ to learn more about Flirt Beauty Boutique and Flirt for a Foundation (also contact Violeta Chulpayev. 646.682.7509). The only option to get real followers is to update your account with good content that people likes and don't for any shortcut, it may be harm your Instagram account. Glad I've found your site, and I fully agree with your opinion on this very important topic. Looking forward to read more such articles here, love to read it! Visit my website to buy instagam likes.